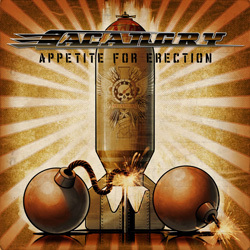 The cover is puerile, depicting a collection of three bombs (two spherical, one air-to-surface) arranged in the formation of a gentleman’s meat-and-two-veg; the song titles – ‘The Balls Are Back In Town’ and the title track itself, for example – are the sort of thing Steel Panther might come up with after a collective lobotomy; and the music offers not one shred of imagination or innovation. AC Angry – the clue’s in the name – re-tread the rifferama of the Young Brothers or Rose Tattoo in their heyday, as re-imagined over the years by the likes of Airbourne and 42 Decibel. Despite their penchant for antipodean-style rock ‘n’ roll the Angrys – Alan Costa (guitar/vocals), Stefan Kuhn (lead guitar), Dennis Kirsch (bass) and, under the circumstances, the appropriately-named drummer Sascha Waack (who’s since shot his load and been replaced by Norman Steisslinger) – are from Saarbrücken, where the top visitor attraction is apparently the Deutsch-Franzoesischer Garten; maybe that’s the reason they’re seemingly more keen to eschew traditional German metal for something more in-your-face and down-to-earth. There’s little subtlety here, and even the acoustic ‘No Way To Go But Down’ shares a considerable amount of DNA with Monster Magnet’s ‘Bummer’. Following on from their 2013 full-length debut ‘Black Denim’ and the ‘Booze Horse’ EP of the previous year ‘Appetite For Erection’ shows that the guys are more than competent (check out the solo in ‘Son Of A Motherf*cker’s Son’), if happy to purvey what many would see as an outdated and irrelevant form of metal. But, having said all that, does ‘Appetite For Erection’ put a smile on your face? Yes, it does. Does it make you want to leap around like a loon? Yes, it does. Does it make you forget all the crap you have to put up with 24/7 for forty minutes? Yes, it does. AC Angry are the perfect antidote to a bad day, or the perfect soundtrack to a long drive, and they’re the textbook festival band – it doesn’t take much imagination to see them winning over and energising a field full of metal fans. Like it or not beer-drinkin’, hell-raisin’, rock ‘n’ roll, as bare-knuckle as it comes, is a winning formula, and like Airboune before them, AC Angry could easily hit the jackpot.